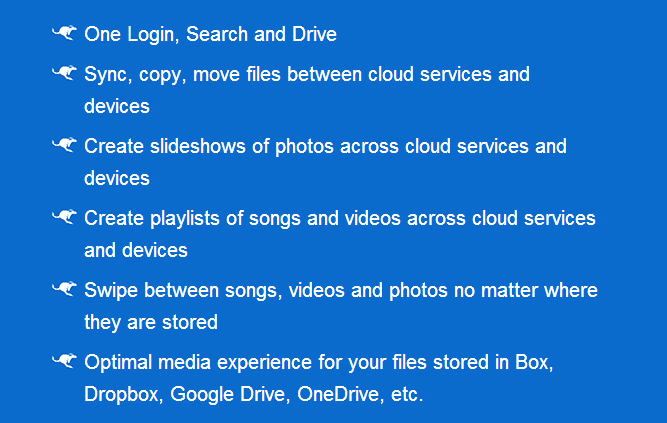 We use various cloud storage services like OneDrive, Google Drive, Dropbox, Box etc. But sometimes, we feel very difficulty in managing all cloud storages, because they are all placed in different-different places and it’s not a simple task to sync them properly. But a very useful solution is available to make us tension free, named Jumptuit. 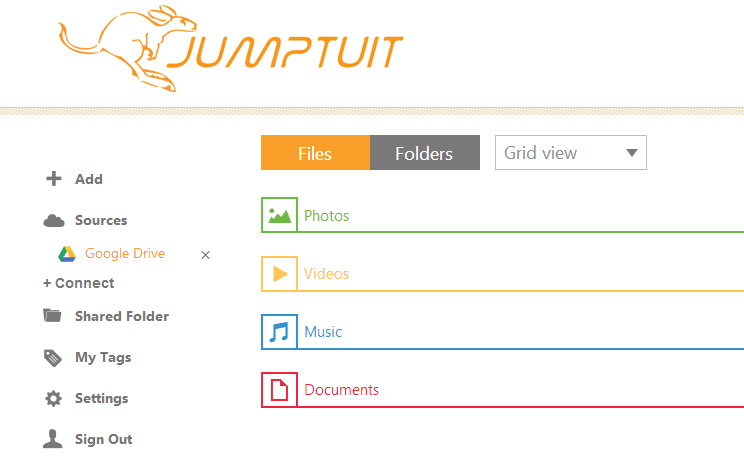 Jumptuit is a new service which helps us to connect with several cloud storage services and manage them all at one place. It offers the facility to sync files between devices and the cloud storage services such as Google Drive, Dropbox, OneDrive, Facebook, Photobucket, Box, Flickr, YouTube, Vimeo and other supported cloud services as well as your Android, iOS/OS X, Windows and other supported devices. 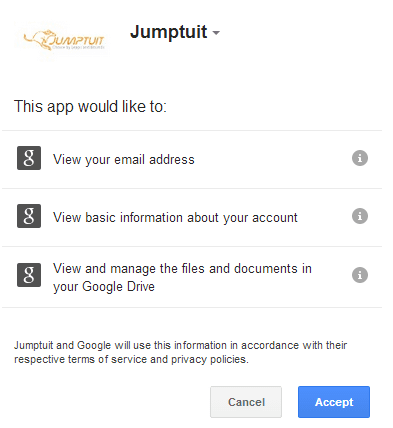 Simply we can say - Jumptuit is the manager of our personal cloud service and devices. With this service, you can easily access all your uploaded files (photos, videos, music, documents) of the different storage at one place. Isn't it a comfortable solution? 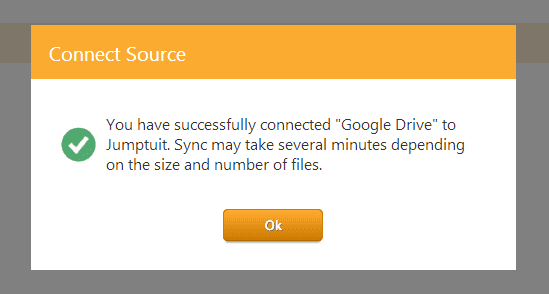 Even, Jumptuit have ability to automatically convert the file formats according to viewing requirement for the compatibility. To get started, at first go to jumptuit.com and click on Join Now! SIGN UP button to create an account. Note: If you are trying to enter more than 8 character password during registration then sorry. You can't. Please try to keep your password length less than 8 characters because Jumptuit allows only 8 character limit for the password. After completing registration, it will ask you to connect the different accounts as shown in below screenshot. Now you have to select and connect the account according to your choice. Here you will be asked to allow them. So please keep in mind, before accepting it always read the list of permission you are granting to them and then click on the Allow button. When your account will be successfully connected, you will see a confirmation message as shown below. According to my knowledge, for free account users they only allow up to 4 cloud services. If you want to add more than 4 services then you will have to be a member of premium account which is 100$ a year. Many people say $100 is too much for just accessing the files from different Cloud Storage at a place. But many people who use cloud services most of the time they are using its premium features. Now it's your turn to say via comments - what do you think about this jumptuit service? What is vprot.exe? And How it Can be Removed? What to do if you have lost your SBI ATM Card? And How to get a new ATM card?